February | 2015 | "Domipheus Labs"
This is the sixth part of a series of posts detailing steps required to get a simple Z80 based computer running, facilitated by a Teensy microcontroller. It’s a bit of fun, fuzing old and new hobbyist technologies. See Part 1, Part 2, Part 3, Part 4, and Part 5, if you’ve missed them. The MREQ and IOREQ lines are used to latch the WAIT line of the Z80 to allow the Teensy to respond to the request. The Teensy senses the WAIT line, performs any actions, and then resets the latch to bring the WAIT line high again (it’s active low). The Z80 continues as normal. So with some simple 74 series logic, the MREQ and IOREQ pins are NAND’d together, producing a rising signal edge if either Z80 output go active low. 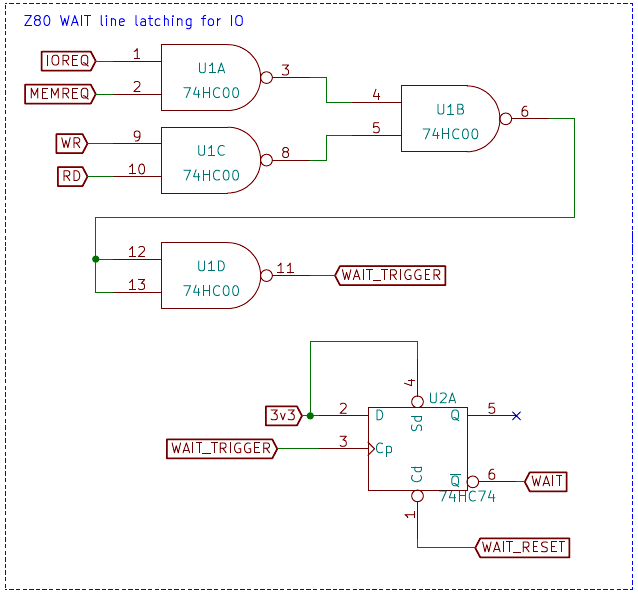 This is fed into a 74HC74 flip flop as it’s clock, with the data pin tied logic high. This allows us to connect the Z80 WAIT input to the notQ output. The clear pin of the d-type flip flop is connected to the Teensy so it can reset it and allow the WAIT line to return high, letting the Z80 continue. I had the Teensy set up to perform an interrupt routine on a falling edge of WAIT. Sadly, this didn’t seem to work. In fact, I could not confirm the interrupt was being called at all. I’ll have to look into this in detail but using interrupts really is an optimization in this case, so I soldiered on. I’ve had several problems with Teensy microcontrollers during these posts. I had two units, one has completely bricked, and the other is very unstable. It seems to be due to the fact that if Pin 33 is low and an input when a program is uploaded to the Arm then the Mini54 chip can fail in some way. The Mini54 chip controls the bootloading process of uploading new code, so it effectively bricks the device. It is an issue that should really be given more prominence as if there was an announcement stating pin33 should never be used in certain ways I’d have two fully working Teensy devices. But sadly, all the documentation still states it as a fully configurable digital pin capable of input and output. Instead of using an interrupt, to try to get something working I created a tight loop() function that didn’t do anything while WAIT was high. As soon as it detected a low signal, it would perform the actions required. I disabled Z80 mode-2 interrupts for now, and removed the I/O debounce code. A very simple example seemed to work – but it was still quite slow, despite an arduino nano driving a clock at around 200KHz which is faster than what the Teensy was providing when running in synchronous mode. 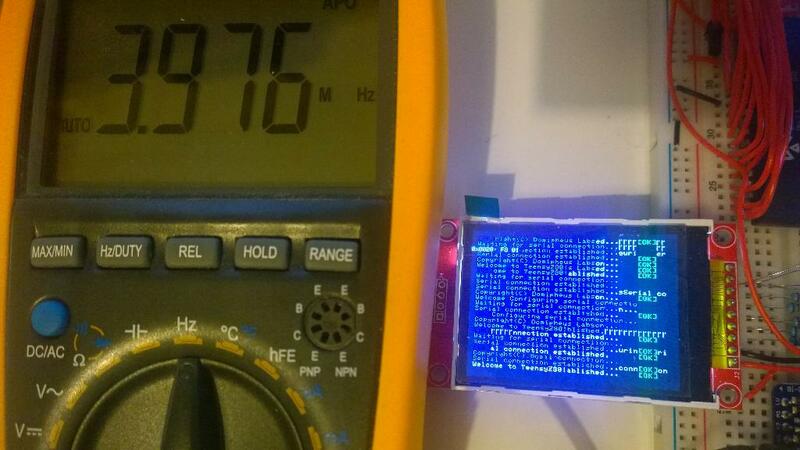 I tried a larger example, one which printed text to the console, and it was obvious something was not right – the output slowly became corrupted. However, there were signs of promise. I was able to input a 4MHz clock and things were failing/corrupting in a somewhat similar way. Still corrupt, but it was the same behavior. 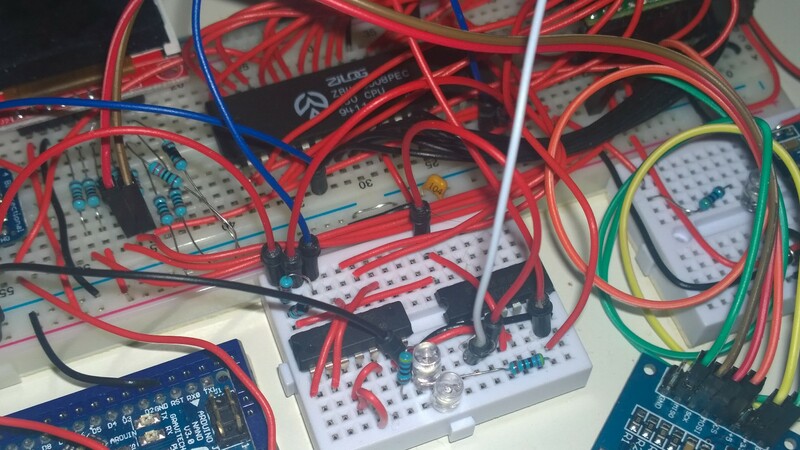 The issue was that I failed to include the RD/WR lines from the Z80 in my latching circuit. You can see from the timing diagram that, especially in the write cases we need to WAIT when those are active too, not just MREQ or IOREQ. I redesigned the latch circuit. This worked a lot better! I could only use the I/O port which put characters to the screen, but it was running well – and my simple test program, which printed “Welcome to TeensyZ80!” in an infinite loop, was stable even at 1MHz. I’d love to break the MHz barrier for this, but given we’re still on a breadboard and I don’t have a scope capable of inspecting this to the detail some of the issues require, I may need to settle for much less. So this simple test at 1MHz is very encouraging. I tried clocking it at 1.5MHz, but some artifacts in the printing arose. When implementing my serial, display and filesystem devices which are accessed as I/O reads/writes, I created a system which relied on implied state behind the scenes on the Teensy. To set the colour of the characters being printed to the screen, two writes to the same port would write high and low values. It’s even worse for the serial device, where you had to write command packets to the I/O ports followed by a variable amount of data. I think i’m going to need to redesign all of the previous work, to operate on separate ports. For example, there will be a ColourHi and colourLow port which together define the 16-bit colour of the console. It’s not much work, but is something I’d overlooked and will take time. This is a very quick update to Teensy Z80 work, It’s still very much ongoing. I’m also working on another project involving the miniSpartan6+ FPGA board. That’s another bit of fun – who doesn’t want to design their own processor? Let me know any thoughts, as always, via twitter @domipheus ! This is the fifth part of a series of posts detailing steps required to get a simple Z80 based computer running, facilitated by a Teensy microcontroller. It’s a bit of fun, fuzing old and new hobbyist technologies. See Part 1, Part 2, Part 3 and Part 4 if you’ve missed them. At the moment, whilst running slowly due to the lock-step synchronous nature of the clock driving the Z80 from the Teensy, we do have a fairly well spec’d out little machine. So, in this fairly short post (it was short, then I went and implemented more than expected! ), I thought I’d delve a bit into software, and in particular, multithreading. 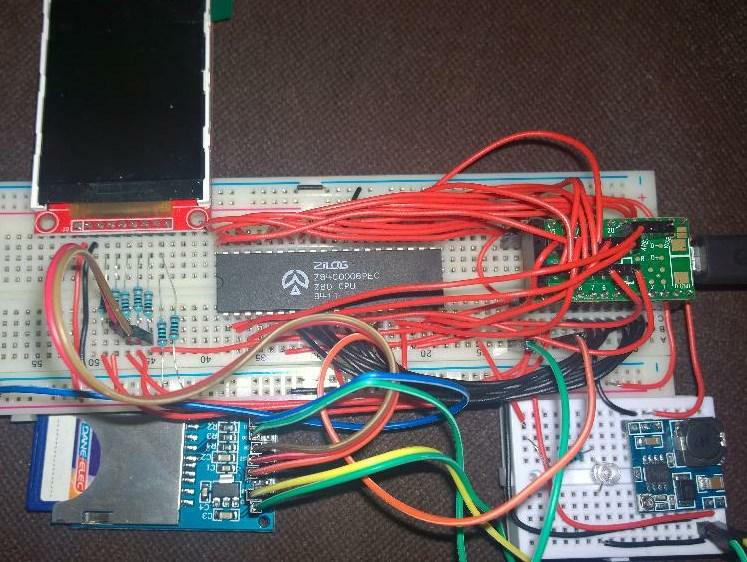 The Teensy starts up with the Z80 unclocked. The Teensy has a global array to represent the Z80 RAM address space (there is no ROM). The Teensy has it’s Z80 RAM initialized to a small bootloader binary, which is assembled at offset 0h, and usually sets the stack pointer, defines some global data such as the interrupt vector table, and then jumps to a known location higher in memory. In the Teensy setup() routine, after mounting the SD card volume, tries to locate ‘kernel.bin’. If it’s found, it is loaded into the Z80 ram array at a known location. If it’s not loaded, the RAM remains in the initial state, which at the moment simply puts ‘?’ to the top left of the screen. The last thing the Teensy setup() routine does is reset the Z80 and start clocking it, so it starts executing from PC 0x0000 when the loop() routine starts running. The Z80 is now in control. Previously the initial Z80 bootloader was the whole program. My simple shell example in the previous post was implemented this way, but it was tedious needing to recompile the Teensy code and re-upload the sketch every time I made a small code change. Now the ‘kernel.bin’ binary is compiled from C using sdcc. I’ve been writing a TeensyZ80.h with all of the port definitions, but I’ve kept everything in a single C file for the following multithreading example. To build the binary, we simply compile without the crt, at code offset the same as the bootloader expects (0x800 in the following cases). SDCC generates an ihx file, which you need to convert to a binary with with hex2bin. Putting that in the root of the SD card as ‘kernel.bin’ runs it automatically. The multithreading I want is time-slice multithreading, where different threads only run for a certain time called the time slice, before being preemptively swapped for another thread. The high level idea is we have the Teensy fire an interrupt to the Z80 each ‘time slice interval’ and the interrupt handler will then context switch to a new thread. That should be all we need, really. We’ll use the same mode-2 Z80 interrupts as before. For this example all other interrupt vectors have been disabled. We need some state stored globally. For our example we will assume a maximum of four threads. For each thread, we need to know the function it starts at, the arguments to that function, some flags, and a context containing the current running state. We throw all that in a struct, and make an array for our 4 possible threads. We will fix the main process thread as the first thread in this array. Global state like this is fine for this implementation. We can guarantee certain access patterns to ensure we don’t get any nasty race conditions, and define rules as to who owns and can write the thread structures to prevent locking requirements. Each thread, as you can see from the internal_thread_t structure above, has it’s own stack area, defined by stack_start. 256 bytes are reserved to each thread for their stack at fixed locations in Z80 RAM.To make things easier, the hl, bc, af, de, ix and iy registers will be pushed to the threads own stack as the context save. The stack pointer itself will be saved to the thread structure within the ctx field, though a write to a scratch memory location ( aka, ld (_stackLocationScratch), sp). The program counter itself does not need explicit saving, as it’s already on the stack. 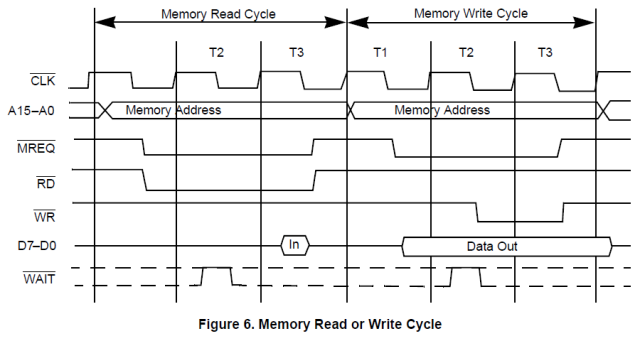 When an interrupt is signalled on the Z80 INT pin, after the current instruction has completed, the PC of the next instruction is placed on the stack, and then a vectored jump through the interrupt table lands you in the interrupt handler routine. We can use this fact to restore the PC incredibly simply, by just returning from the interrupt routine, with the stack pointer that of the new thread we want to execute. The simplest interrupt routine, which will do round robin scheduling, and assumes 4 active threads, is listed below. The Z80 actually has two banks of registers internally. the exx instruction, along with the ex af, af’ instruction, swaps the current active bank. This is useful in case we needed lots of registers and wanted no stack, but not essential here. If the code to choose the next thread was any more complex, we would need to load in a stack pointer into the sp register for use in kernel routines, as to not use up the thread stack – which may be nearly full. The restore registers body of code is the mirror of the state save, so the reti instruction should find the PC on the stack that is correct for the thread we have swapped to, as that thread itself, upon entry to the interrupt routine, would have had it’s PC pushed to stack. Using this makes starting threads rather easy. When we create a thread, it’s flagged as ZTHREAD_NOT_STARTED, so it’s not selected in the scheduler within the interrupt handler. When the zthread_start function is called, we know the first time the thread can actually be started is when it’s selected within the interrupt handler. Looking at the handler, and how the restore of state for a thread is performed, we can construct the stack of this thread to make it look as though it was preempted exactly at the entry to the start function. Knowing this, before setting the thread as ZTHREAD_RUNNING, if we populate the stack locations of the thread as per the table below, we can let the interrupt handler take care of the rest! With this set up, when our thread is selected to run by the round robin scheduler within the interrupt routine, the registers will all be set to 0, and then the return from interrupt instruction will load startFunc into PC for the next instruction fetch. From here, the calling conventions dictate the return PC is next on the stack, followed by the function arguments. Therefore when startFunc() returns, we will load the _TZL_thread_exited() function address into the PC, to begin the thread exit logic. At this moment, we can just ignore that function, and try out what happens if we launch some threads which simply print characters. Joining threads is a basic operation that must be supported. Joining is the act of suspending one thread until another has completed or exited. We can implement this in a very simple way, by having a ZTHREAD_WAIT_JOIN state, in which the thread will not be scheduled to run, and then when other threads exit, we can check in the _TZL_thread_exited() function if threads exist in a wait state that are waiting for the thread that has just completed. If we find threads that have the ZTHREAD_WAIT_JOIN flag, with state_data set to our zthread_t handle, we can set their flag to be runnable, and clear the state_data. // For now, just set the flag as free. // look to get any return value. // this thread ends here. halt so we can be swapped out. Halting the Z80 means that no code will run until the timeslice interrupt fires. It’s placed in a while(1) block in case another interrupt which is not for the scheduler is fired. we do not encounter this in our example, though. A side effect of this is now we have waiting, we can deadlock by having two threads join to each other. We can actually check for this directly in the join() call, but there can be chains that are harder to decipher. We can add code to the scheduler that detects when there are no threads available to run, and signal a deadlock. The panic_deadlock() function can print a message to the user along with some state about each thread for easy debugging. Note the stack is modified to be at a safe known location as the thread stacks may not have enough size left in them to call the panic function, and also we may want to debug them at a later date, so it’s best to leave them unchanged. The complete join function is below. There will be times that we do not want other threads to run, or when we are manipulating multiple bytes of data. Examples of this are writing to the screen, setting colour and the row/column we are writing to. Those functions are not thread safe. The join function, too, may be better within a critical section, except from the halt at the end. This is to ensure all threads have updated and consistent state before they have a chance to run. On the Z80, byte writes will actually be atomic, as the interrupt pin is only sampled after a whole operation has completed. Critical sections can be implemented very easily: we simply disable interrupts for the duration we need. This will stop all other threads running and stop things that depend on interrupts, so we need to account for that, but it’s easy to add and perfectly fine for this use case. We have thread_create, thread_start, thread_join, the ability to create critical sections, and a round robin scheduler. The test below, runs as to the video (apologies for shaky-cam!). Things we would want implemented next are true exiting of the threads, with return value capture. I’d call that a good enough implementation for Teensy Z80. I don’t think I’ll be making much use of threads in anything I write for this, especially given the current speed of the system. The next thing on my to-do list is to get Teensy Z80 faster. Code as always is on my github. I hope you’ve been enjoying this Teensy Z80 project. If you have, let me know on twitter @domipheus!